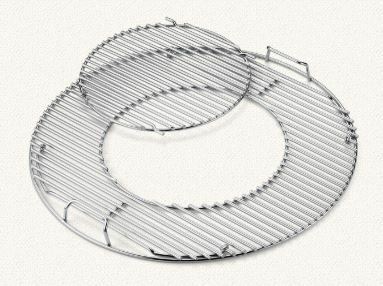 Upgrade Your Weber Kettle Grill Grate: Stainless Steel and More! 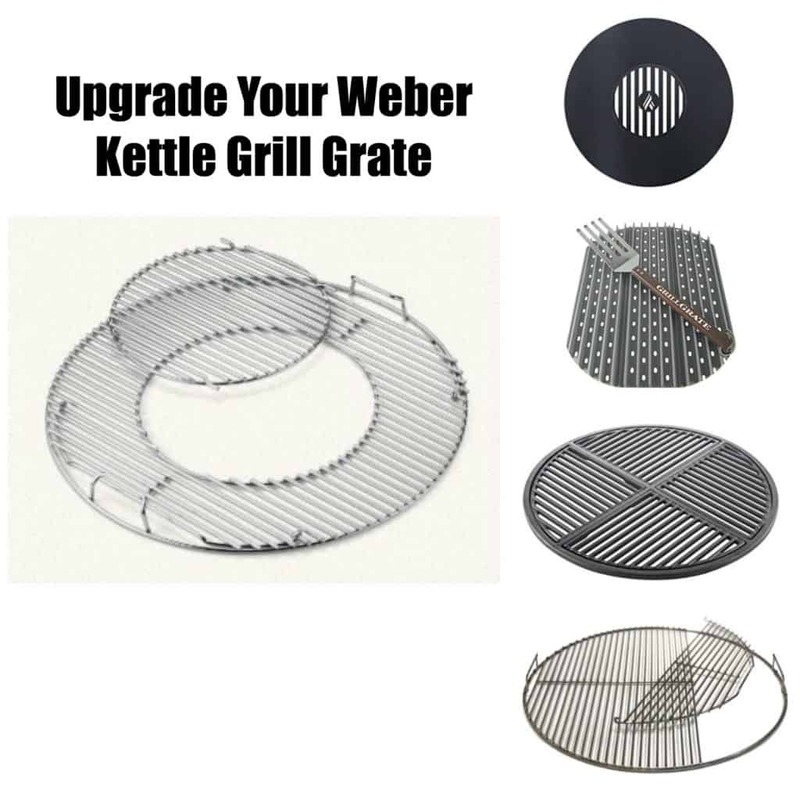 If you want to have more fun with your Weber kettle grill then you need to upgrade your grill grate. 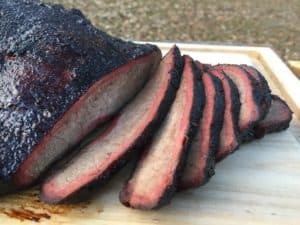 There are a surprising number of grate options available for these grills so there is no reason to settle for the standard issue Weber product. Let’s look at five different grate upgrades you can add to your kettle. The grate that came with your kettle was made of nickel plated steel. It looked like stainless steel when it was new but wasn’t. A stainless steel grate is a wonderful upgrade because it will last for many more years and is easier to clean. Weber does not make a stainless steel grate for their kettles anymore. 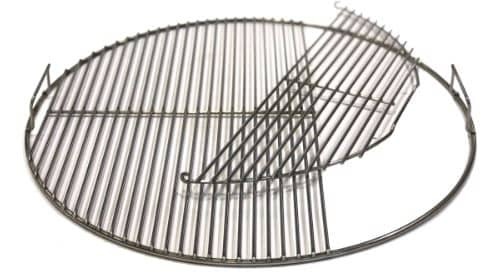 There are several people selling what they call stainless grates on Amazon but I know that at least two of them are just repackaging the standard nickel plated grate and ripping people off. The only company I know of that sells a REAL stainless steel grate is the Adrenaline Barbecue Company. The grate from ABC is made in the USA from 304 stainless steel and is hinged for easy charcoal addition. The handles for the grate are welded on the top of the grid instead of the sides so it is easier to rotate if desired. The grate is offered with free shipping in the lower 48 states. The Gourmet BBQ System is a Weber product that is a substantial improvement over their standard grate. The Gourmet grate is made of nickel plated steel but the rods are a few millimeters thicker than a standard grate so it will last a year or two longer. The Gourmet grate has a 12 inch removable center insert that can be replaced with a bunch of different accessories which are sold separately. The inserts include a cast iron sear grate, wok, pizza pan, poultry roaster and cast iron griddle. There are three cast iron grate choices for your grill: Craycort, Stok and Aura. Don’t bother looking at the grate from Aura. The cast iron grate from Aura is thin, poorly made and has a tendency to crack if used with high heat. Let’s look at the two other choices, Craycort and Stok. 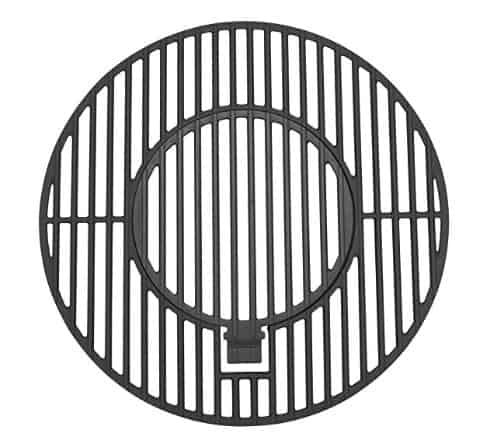 This grate was designed to fit the Stok 22.5 inch charcoal grill but it is also an exact fit for a Weber 22.5 inch kettle. The Stok grate is similar to Weber’s Gourmet BBQ System. The grate has a center insert that can be removed and replaced with other inserts like a griddle, wok, etc. The Craycort grate is very different from the Stok product. A Craycort grate consists of a cast iron frame that seats four modules. The grate comes standard with four regular grill modules but different ones are sold separately. The one I had included a grill, griddle, wok and veggie pan. It was a blast to play with. Craycort Grates are available for all kettles sizes except the Ranch. The extra inserts are available on the Craycort website. 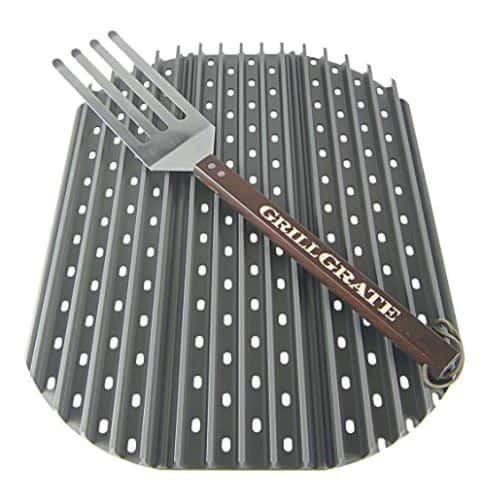 GrillGrate panels are designed to sit on top of your grill grate and do not actually replace it. 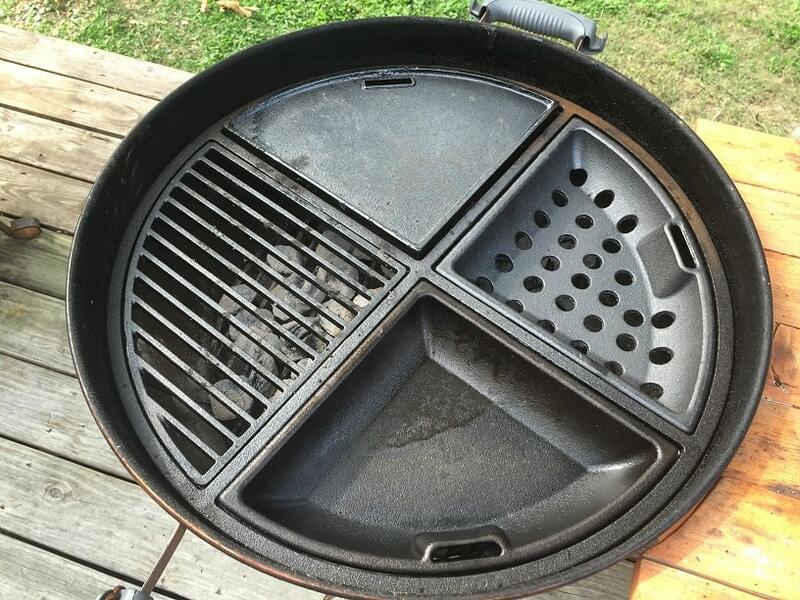 That being said, GrillGrate offers a three panel set that is custom cut for a 22 inch kettle and once you use them you will never want to take them off. They eliminate flare ups almost completely. They put down killer grill marks. They make grilling with direct heat just flat out stupid easy. You can read my full GrillGrate review here. The kettle insert from Arteflame converts your kettle into a wood fired griddle and comes with a removable center sear grate. Here is a nice look at this insert being broken in and seasoned for the first time. The video is a fun watch. The insert is made in the USA from 1/4 inch thick carbon steel. You can read a more detailed Arteflame grill review here. Arteflame inserts are available for 18, 22 and 26 inch kettles. With all of these cool options available there really is no reason to buy another standard grate for your Weber charcoal grill. Whether you like stainless steel, cast iron, gadgets or griddles there is something listed here that is an easy upgrade to add to your kettle.